All transactions are safe and secure with a reliable history in online purchasing behind each of our associates. 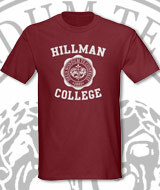 Buy the Hillman College t-shirt to own Cosby Show clothing and merchandise. Grandpa Huxtable, Heathcliff, Clair and Denise could all wear this Hillman College shirt with pride and now you can too. As shown by Denise, you don't have to be an alum to promote it. Her short-lived, yet amusing college experiences were seen on The Cosby Show spinoff, A Different World. Although it wasn't a fit for her, it did manage to produce some top notch professionals who went on to raise one heck of a family. Let's go Hillman, let's go! The college is home to track star Combustible Huxtable. In addition to the Hillman College tee above, browse the Cosby Show Clothing Gallery for more apparel like men's and women's clothes, kids shirts or hoodies.